It’s cold outside but you're on the list for the hottest club in town! 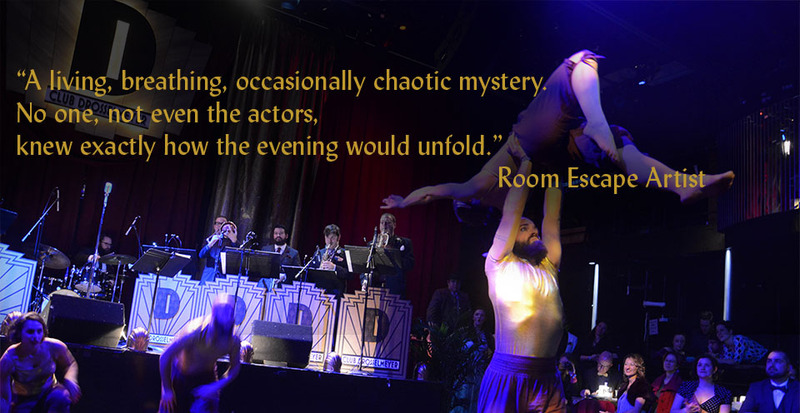 It’s 1941, a new year at Club Drosselmeyer: new challenges, new faces, new acts… and new adventures. Herr Drosselmeyer and his niece, Dr. Clara Stahlbaum, are busy with research and development at Drosselmeyer Industries including Project Nutcracker, version Delta! Join dancers, divas, acrobats, magicians, sugarplums, dandies, hardscrabble detectives, soldiers, rosies, rat kings and spies as they all race to be the first to crack intercepted messages from the enemy... because whoever controls the information will win the war. 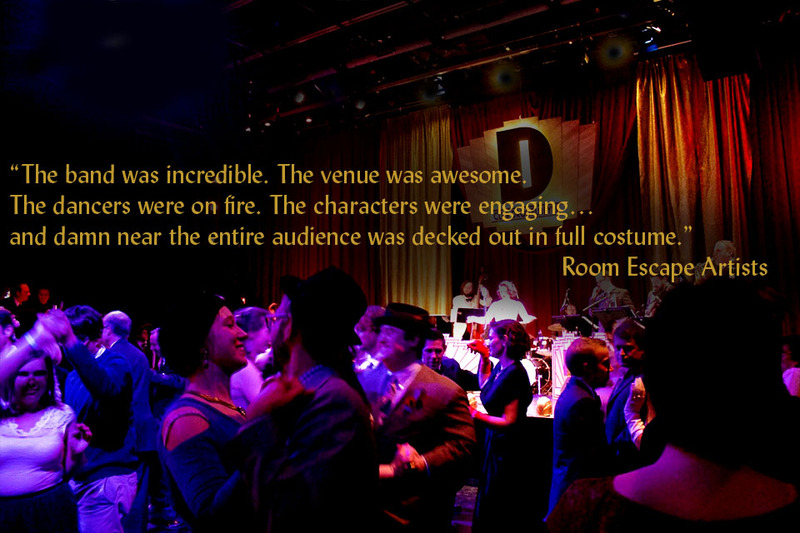 who will you meet at Club Drosselmeyer? Herr Drosselmeyer is a scientist and inventor. He’s something of a “magician” and a man of mystery. With the war heating up, Herr Drosselmeyer has left research of Project Nutcracker to his neice while he focuses on his new role as leading the US Navy’s newest branch: cryptology. Fritz Stahlbaum just never got the family scientist gene. Herr Drosselmeyer made his nephew manager of Club Drosselmeyer but Fritz wants to be his own man- maybe even join the Air Force. In the meantime, he’s working for the Civilian Air Patrol. While Herr Drosselmeyer is proud of his former assistant Greta for moving to NY to pursue her dream of producing “Drosselmeyer: the musical” he certainly misses her competence and is not so sure about the bodyguard assigned to him by the navy: Ensign Pete Van der Fleek. Ginger Lamarr, star of stage and screen, is back again to lend her voice and glamour to our 8 piece swing band. She’s glad see her old friend, Herr Drosselmeyer- and she’s hoping his influence, or yours, can help her land a juicy new part as a spokeswoman for… some thing she heard about. Dr. Clara Stahlbaum is an expert in Artificial Intelligence and Robotics with her PhD from MIT. Now, she works with her uncle at Drosselmeyer Industries as lead scientist of a promising new military technology: Project Nutcracker, Version Delta. Rhett “the rat” King, head of King Technologies has left the racketeering game and is interested in a more lucrative career: military technology. With his impressive new robot, the Ratbot3000S, Rhett made lots of connections and now heads up the Army’s new Cryptology department. Sugar Faye is a rising star who is THRILLED to be co- hosting a Voice of America broadcast live from Club Drosselmeyer with Fritz Stahlbaum!! She’s hoping to land a job as spokeswomen for WOWs… the Women Ordinance Workers. The Ratbot3000S is hard at work cracking codes for the US Army. But scientist, Vera Kandilova has wiped her bot’s software many times. With multiple upgrades and system reboots is this supersoldier android starting to show chinks in his armor?? 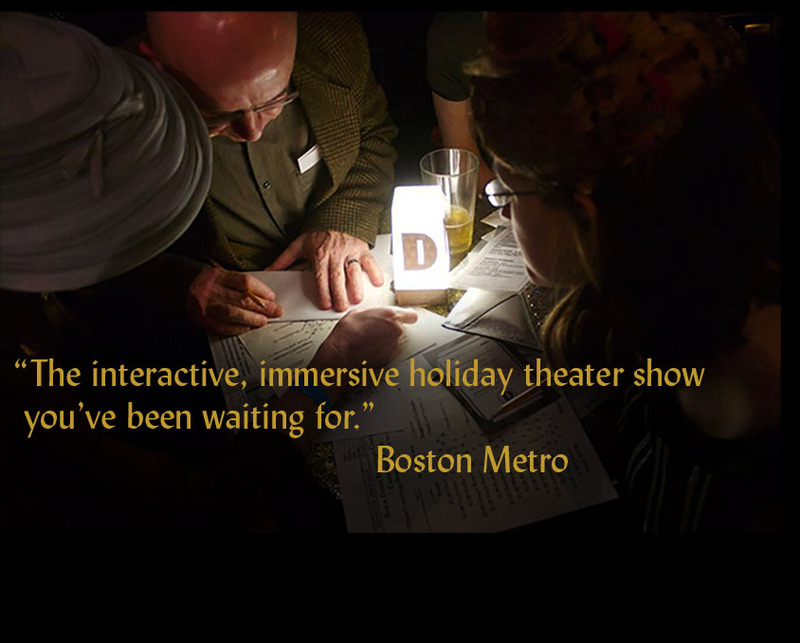 Club Drosselmeyer is an immersive, interactive show set in a 1941 nightclub. You can grab a drink, watch the floor shows, listen to our live 8 piece swing band and original swingtime Nutcracker arrangements and of course, dance the night away. If you'd like to interact, you can speak with various characters throughout the club to figure out more about the story and help them solve puzzles and completing tasks. Do I need to interact to enjoy the show? You're welcome to just enjoy the show, hanging out in a 1940's nightclub is pretty fun! If you want to solve some puzzles without interacting, perhaps team up with somebody who would rather interact than solve puzzles! You definitely will not be dragged out to interact in front of the full audience, all interactions are personal, like chatting with someone at a bar. What are the different ticket options like? Standing Room tickets ($49) are great if you don't mind being on your feet or are planning on being up and about for the evening. Floor Tables ($69) are placed around the dance floor, so they're in a great central location to access the various characters, and it also gives you a nice home base to work at and a good view of the performances. The Banquette seats on the Mezzanine ($59) are perfect for puzzlers who want ample table room and folks who want to be a bit out of the bustle of the main seating area, though you may need to stand or move a bit to get a clear view of some of the performances. The VIP Mezzanine Seats ($89). Tickets are available here! We highly recommend dressing up: it is fun to have an excuse to dress your best and if everybody dresses up, it helps with the immersion! If you don't know how to dress like it is 1940, just dress to impress! Check out these 1940's style guides for men and women if you'd like to dress appropriately for the time period! Who would enjoy this show? Do I need to be a dancer/puzzler/younger/older/introvert/extrovert? We've specifically designed the show to be enjoyable for all different engagement levels. You can interact as much or as little as you'd like. Some of the pathways are more puzzle-y than others, and there will be "waiters" around the club to help you find a way to enjoy yourself, or help you out if you get stuck! Dancing is entirely optional. Folks of all different ages from 10 to 93 came to Club Drosselmeyer last year and had a great time! Is the show different from last year? The show is completely different than last year! All new story! All new puzzles! Of course, it still involves the same Nutcracker characters you know and love, but this year it is 1941 and the situation has changed. Our dress rehearsal went great! Feedback from our testers was very helpful and we're making a few tweaks to the show to make it even better! This was our first time seeing some of the dance acts, and they looked incredible! We'll be putting the finishing touches on some puzzles and rehearsing our interactions and scenes for two more weeks, then it's showtime! 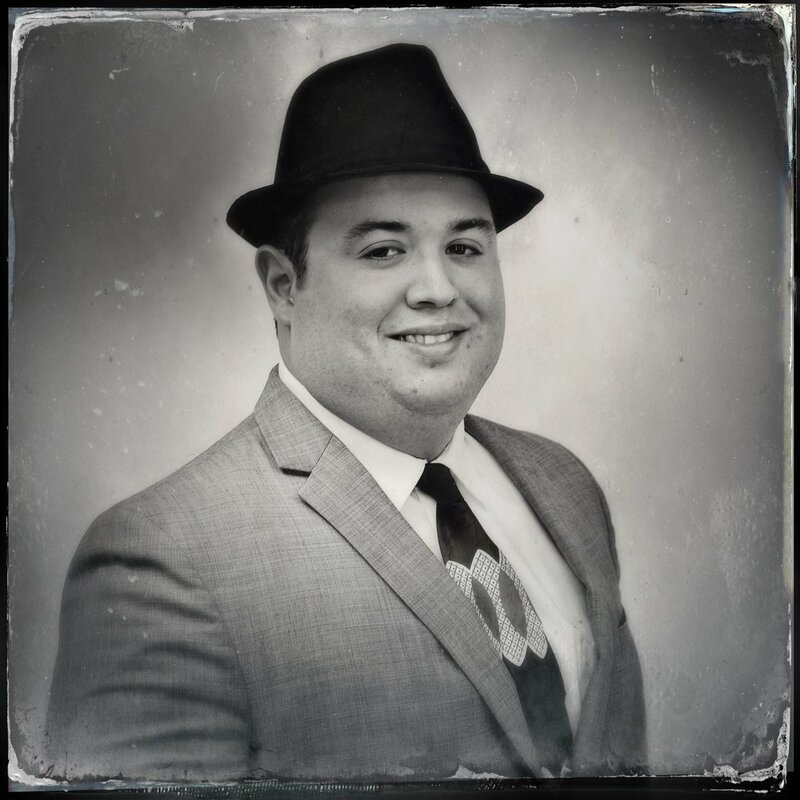 This weekend was the very first vintage photo shoot for the Club Drosselmeyer crew. We had hair, makeup, suits, pocket watches, vests, bowties and hats. So. many. hats. We took pictures until our photographer's hands started to hurt. (not an exaggeration.) All this... just for you! How else will you know who to talk to for puzzles, mysteries and stories when you settle in to your table at club drosselmeyer?